2015 has been great for Years & Years. Emerging from the back of a BBC Sound of 2015 win, the band achieved their first number one single with ‘King’ followed by their first number one album, ‘Communion’. Add to this the huge fanbase they’ve amassed and it’d be easy to understand how this headline tour sold out all its dates. 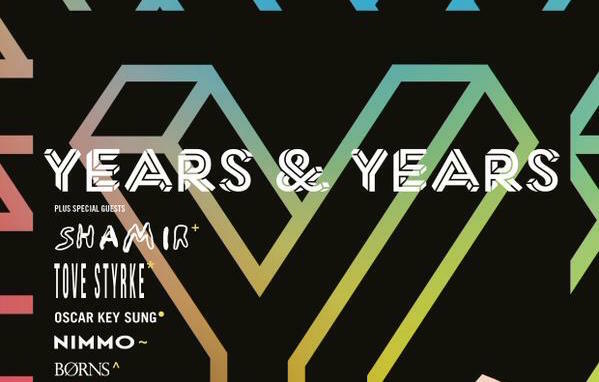 For their Liverpool date, Years & Years opted to use the city’s O2 Academy. It’s a safe choice for an emerging mainstream act, a large capacity space (roughly 1200 people) familiar to many concertgoers. Despite the boiling hot temperature inside (a stark contrast to the cold weather outside), fans and performers alike seemed to be in good spirits. Despite the electric atmosphere and grand scale venue, leading support act Oscar Key Sung emerged on stage to little fanfare. The crowd paid very little attention to him, with plenty of people even talking over him. As soon as the electronic beats kicked in though, it was clear that the Australian singer would actually resonate quite strongly with the audience when given a chance. The similarities to Years & Years were quite clear – the electronic beats, R&B-style vocals and loose dance moves could have easily came from the band themselves. Oscar is no carbon copy though, and even with a sound reflective of Drake and The Weeknd he bears a style all his own. Unlike Oscar Key Sung, American singer Shamir’s music has few parallels with artists currently impacting the mainstream music scene. However, like Oscar, Shamir also has a style all their own. The music’s elements of electronic, hip house, disco and house allowed for a much more unique set, combining a countertenor voice, energetic beats and playful lyrics. Immediate fan favourites such as ‘On The Regular’ and ‘Hot Mess’ were enthralling and entertaining, not to mention incredibly catchy. Shamir’s entire set was a brilliant amount of fun, keeping the night’s hysteria at a high. After two incredibly fitting support acts, the anticipation for Years & Years was high. As a result, the crowd exploded as the band entered the room. It was apparent that the audience were massive fans of the group, so the group needed to match the hype levels in the room. Even from the early songs in their set, it was an achievement they reached with ease. The quiet opening of ‘Foundation’ quelled the chatter in the room, allowing for the commanding and irresistible tracks ‘Take Shelter’ and ‘Desire’ to take the lead. Lead singer Olly Alexander seemed to be having as much fun as the audience, looking exceedingly overjoyed to be on stage and dancing frantically. At one point, he invited two girls up on stage to dance with him as he sang ‘Border’, a thrill not just for those on stage but for those watching too. This level of fun was the main pull of the concert, an element maintained throughout every upbeat song and Olly’s infectious joyful attitude. It was clear that Olly had been caught up in the entertaining atmosphere in the room, almost as if he wanted to party alongside the audience. With a strong set list (including a brilliant cover of Britney Spears’ ‘Toxic’), frequent audience interaction and illuminating stage presence, the set was fun from start to finish. The band’s slowed-down songs and strong lyrical content shone through, however it was the upbeat nature of the night which stole the show. If dancing and letting loose sounds more like your kind of concert, then a Years & Years show is definitely along the right lines.